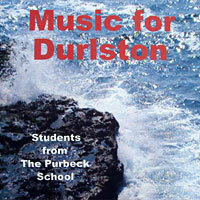 Music inspired by the sights and sounds of Durlston Country Park. Composed and performed by students from the Purbeck School, Wareham, with the assistance of Ian Pillow (local composer) and Stephen Williams (acting Head of Music). A calm and gentle start to the CD with a group composition by some talented year 9 students (age 13/14) who worked with Ian to produce this delightful piece. Inspired by the meadows and flora of the park, together with the sense of well-being one has whilst there. It has already received its first public performance at the Year 9 awards evening prior to the release of this CD. The mood changes with a soundtrack to an imaginary film with the first of our year 10 (age 14/15) GCSE examination pieces. Geraint stated “I wanted to show the darker side of Durlston” which he does with this story of smuggling and those who fought against the smugglers. The listener is free to create their own images to the music. The piece was created using 17 overlaid tracks on the computer. Carlo writes: “I decided to write a rock piece, because of the rocks and stones of Durlston. My piece is influenced by alternate rock and ska, hence the title ‘Coastal Scar’, scar being a pun of ska.” Another GCSE composition, again multi-tracked on computer but using acoustic instruments rather than synthesiser. Chris writes: “The piece ‘Quarrying’ was inspired by stone works that took place at Durlston Country Park. The piece is all percussion, using the drumkit, percussion, and ‘found sounds’. The found sounds are meant to represent the work on the stone, for example, a metal chair leg is used to give the effect of chiselling into the cliffs. The strong rhythm used on the floor toms all the way through the piece is there to represent the intense work and pressure of the quarrymen. Another GCSE composition, again multi-tracked on computer but using acoustic percussion instruments. Tim writes: “As Durlston Country Park is on the coast, I decided to compose a calm and reflective piece (like the sea) for piano. I was also inspired …..(by) Ludovico Einaudi, as I know he writes many calm and reflective pieces for piano.” A very lovely GCSE composition. The other year 9 piece on the disc, this focuses on the interplay of the two instruments, thereby the pun in the title. A change of style to jazz. Phil created and recorded the backing keyboard part first, then improvised the saxophone part live over the top. The pun on ‘blue sea’ was too good to miss. Another GCSE piece. Rikki writes about his piece: “I decided to base it on the calm sea and cool breeze I felt that day (when we visited the park). I decided to set it out in an arc shape, ie ABCBA”. More good GCSE work. Richard wrote following our visit to the park: “The atmosphere of me and my mates really emphasised the fun of growing up, and how much fun we have every day, which we may not experience in adult life. This really inspired me to write quite a melodic piece to make me remember the good times in life.” Richard recorded this instrumental version especially for this disc – the vocal version had its first live performance at the school gig night this July. A great GCSE track to conclude the album. Year 9 and 10 students from the Purbeck School had the chance this year to take part in an innovative project to explore the natural wonders of Durlston. After a day exploring the Park with the Rangers and local composer Ian Pillow, the students set to work expressing their experience through a diverse range of musical styles. Along the way, they learned some composers' ‘tricks of the trade’ and looked at how other musicians have represented the natural world. "When Ali Tuckey and I first discussed this project we were open minded as to how it might evolve. The basic idea was to bring some Purbeck School students who had some skill in music-making to Durlston and see what creativity was sparked by the experience . The results have well and truly exceeded my expectations and throughout the CD there are examples of outstanding muscial originality. To see the school music block taken over by sixteen eager young composers working in groups, pairs and individually was amazing. Steve Williams was brilliant at helping convert some extremely imaginative aural ideas into reality and we both gave some guidance on texture, structure plus a few harmonic refinements; but we kept our input to a minimum. All these pieces are very much their own work." Copies of the CD are available from the Visitor Centre for £5, with proceeds going to the Durlston Appeal. Many thanks to DepARTure and Friends of Durlston, who provided funding for the project and to the students, for their commitment, enthusiasm and creativity.